Like any piece of art, texture, color, value, line, space, and composition are extremely important when arranging flowers. When choosing flowers, I like to focus on texture, color, and composition. Your color pallet will depend on personal preference, but I tend to work in color families (shades of blue, shades of pink, etc...) or warm/cool color pallets (red/yellow/orange/pink or blue/green/purple/white. If you want your arrangement to pop, look for flowers that contrast with the background color. For example, my house is a grey tone, if I want the flowers to pop, I would need to choose warm colored flowers. If I wanted the flowers to blend with my home, I would need to choose cool tones as grey is a cool tone. To me, texture is one of the most important elements. If you choose items that are all the same texture, each item is lost to the group. You want each item to stand out, so its best to mix a variety of textures within your pot. For example, in this post I use Angelonia, Vinca, and Sweet Potato Vine to create the pots for Stella's playhouse porch. Angelonia is a very whimsical flower. 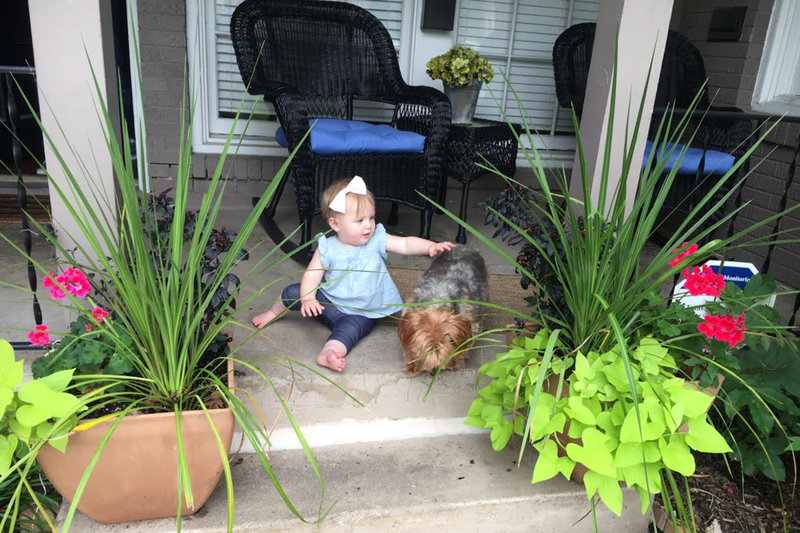 It's blooms not only have height, but also movement as they reach out in various directions. For this reason, I chose Vinca for my filler flower as it is a mounding flower. It doesn't grow tall or cascade out. It provides a contrast to the whimsy of the Angelonia. Composition refers to the actual arrangement of your container. An easy formula focuses on 3 main levels of flowers: THRILL, FILL, & SPILL! While all forms of flowers are beautiful, there really is an art to arranging a beautiful pot or arrangement. 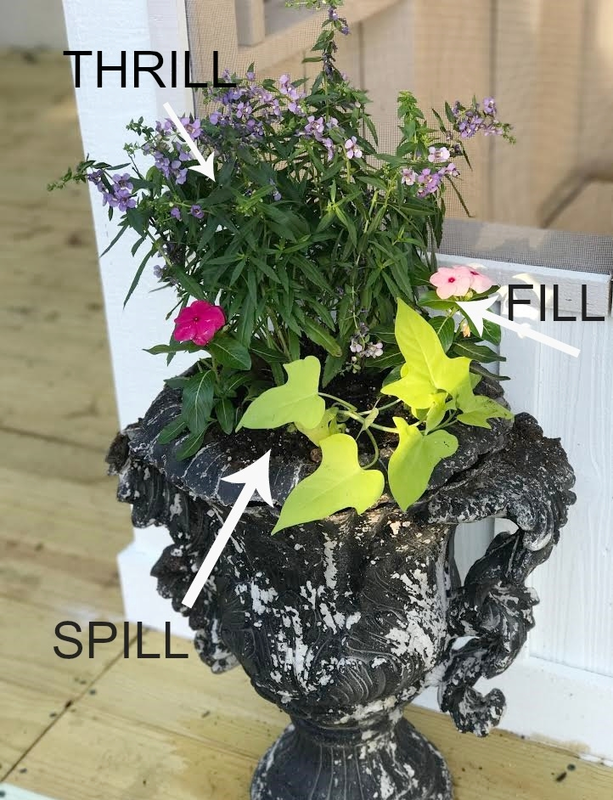 By following these tips, I am positive that you will be able to create stunning containers for your porch, patio, or yard this spring! It's important to keep in mind that your pot will fill in over a couple of weeks! Make sure not to overcrowd your pot initially. They will fill in and be lush within a couple of weeks!! Are you planning on potting flowers this spring? If so, what flowers are you using? Please share any favorites you may have!!! Happy planting! !